. . . BRIAN WINGARD . . . 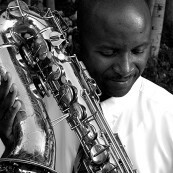 Originally from Cleveland, Brian earned his Bachelor of Music in Jazz Studies from Central State University. Time invested there included training from Norris Turney (Duke Ellington Orchestra), Lester Bass (Count Basie Orchestra and the Lionel Hampton Orchestra), Vince Genova (Sonny Stitt, Clark Terry, Nancy Wilson, Eddie Harris, and more). It was also there that Brian's own performance career began with the Brian Wingard Jazz Quartet. 2005 brought a move to New Mexico, setting up current study relationships with seasoned jazz veterans Bobby Shew (Grammy- nominated trumpeter) and Eddie Daniels (Grammy Award-winning clarinetist/saxophonist). Brian also shares his gift of musical talents with students within the New Mexico public school system. He performs regularly with the Brian Wingard Quartet and makes guest appearances throughout New Mexico. A modernist on both tenor and soprano saxophone, Wingard also composes challenging music, enjoyed by his audience.